Sitting around a fire outdoors is a deeply satisfying way to socialize. Around here, there is always a wood fire burning when guests arrive. Although small, the glow of a fire draws people in, making them feel welcome and at home. Even those that are shy will soon be adding sticks as the coals burn down, while the more outgoing will be telling stories, striking up a tune on the guitar, or gazing into the flames. 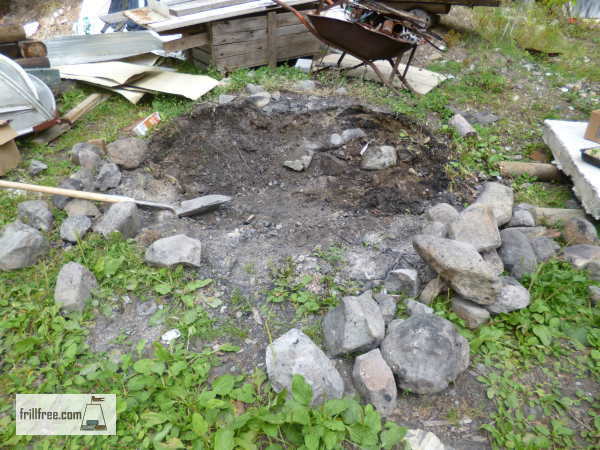 The fire pit that has been active for a long time really needs some work. 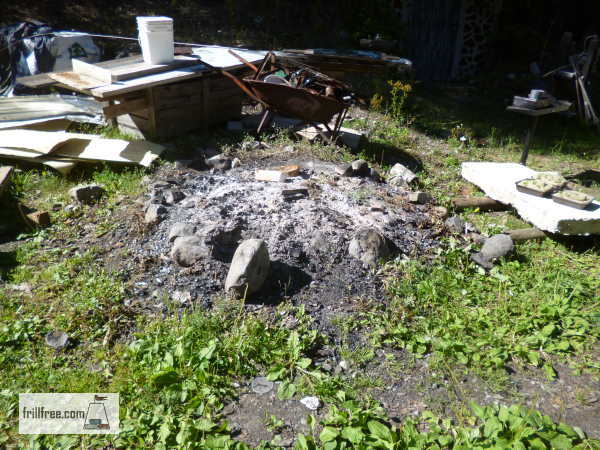 It's also been used for burning scrap wood, some of it with nails in, and the ashes have built up over time. Sometimes, the rocks surrounding it split and break under thermal pressure, and become dangerous underfoot. 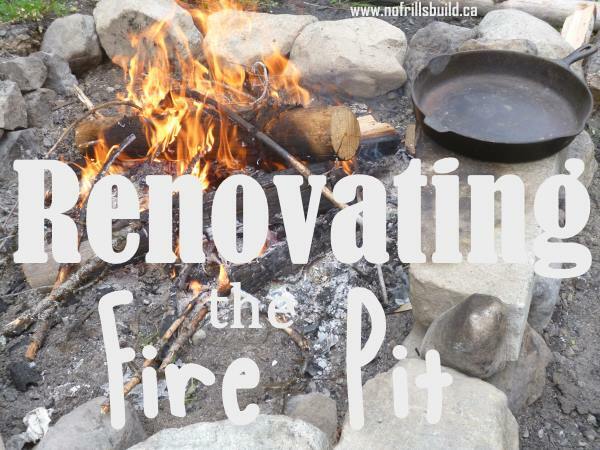 It's time to renovate the pit, making it more user friendly and easy to use. First, removing the old stones that have split and cracked over years of fires. Any that were still sound, and large enough were salvaged to be used again. New stones were dragged down from the hillside, some of which are almost as heavy as I am. The best way to move large rocks is with a freight dolly, which eliminates having to actually pick them up. They can be moved to the site, then wrestled into place, and small flat rocks used to shim them to the right orientation. I tried to make as many of them flat on the top so as to make places to set pans, beer bottles or coffee cups as possible. There were five or so wheelbarrows full of old ashes, built up from several years of use. Because there are nails and pieces of metal, we use an old speaker which has a big magnet in it to catch them all before the ashes are dumped. 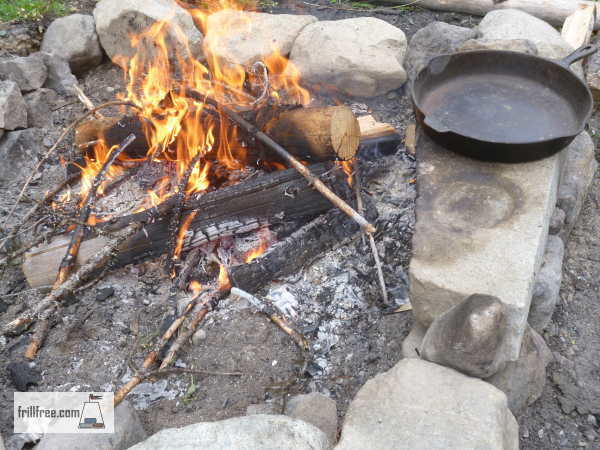 The all important activity of cooking over the fire means that there has to be a way to support the grill over the coals so it keeps the frying pan or grilling meat the right distance from the heat.